You have probably heard "Put your shoulder into it!" and "Shoulder your responsibilities!" But how often do you really think about your shoulders? Doctors of chiropractic encourage patients to get to know their shoulders, particularly the muscles, ligaments and your rotator cuff. Your natural health care providers will educate you on how to keep the area healthy and strong and prevent disease and injury. 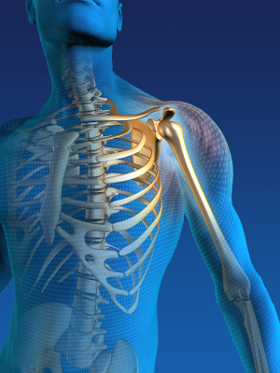 While the shoulder is the most movable joint in the body, it is also one of the most unstable. Frequent problems include sprains, strains, dislocations, tendonitis, bursitis, torn rotator cuffs, fractures an arthritis. While other joints are limited in their motion the shoulder is a freely moving joint, leaving it vulnerable to injury. There are many different soft tissues in the shoulder including ligaments, tendons and muscles. Each of these has the ability to be compromised by improper motion or overuse. These soft tissues all work together to create the movement and strength required for proper function, making diagnosis of the troubled area more difficult. There are a number of conditions specifically seen in shoulder-related problems. These include rotator cuff injuries, most commonly seen in athletes who throw or use similar motion. Any sports activities like baseball, tennis, or swimming are particularly susceptible because they require repetition of rotation of the shoulder or reaching upward and forward. Individuals whose work requires constant arm rising or keeping shoulders in an elevated position are also at high risk for shoulder injury. No one is immune from injuries, as they may occur from performing routine tasks that put a sudden strain on the shoulder. Ignoring the inflammation and pain and continuing to use the arm (for elevating) may cause the tendons to tear. Shoulder Impingement Syndrome is often seen in aging adults. In this circumstance, blood flow is compromised causing muscle tissue to fray like old rope. Typical symptoms include pain and difficulty reaching behind the back or with overhead use of the arm. If this process continues and blood flow is not restored, further injury may result. The shoulder is a significant referral site where pain may occur from injuries or conditions existing in other parts of the body, such as the neck, lower back, hip and leg. Symptoms of cardiovascular disease may also be referred to the shoulder region making the sudden onset of shoulder pain an issue that should be immediately evaluated. Dr. Hatesohl and Dr. Schneider are experienced at determining the cause of shoulder discomfort. An in-depth examination will be conducted. Chiropractic is an excellent resource to consider for creating a care plan to help you throughout the healing process. Plan frequent breaks, warm up and cool down properly if you play sports that involve repetitive throwing or arm rotation or work requires frequent lifting (like placing things on high shelves). If you are having discomfort or pain, schedule a chiropractic check up. Beware! If you neglect shoulder pain at the onset of symptoms, the pain may lessen or go away. This does not mean that the problem has gone away; you still need a check up. While a torn tendon may "patch" itself, and the pain decreases over time, it does not reverse the damage and is not cured. Listen to your doctor. Your chiropractor will listen and consider your activities and physical condition when planning a rehabilitation program. If you have suffered a rotator cuff injury an regularly participate in sports or other strenuous activity which uses your shoulders heavily, ask your chiropractor when it is safe to return to your activities.